Background and objectives: Guidelines recommend that candidates for kidney transplantation (KTx) who do not have diabetes perform a pretransplantation oral glucose tolerance test (OGTT) when fasting plasma glucose (FPG) is <110 mg/dl (<6.1 mmol/L); however, the OGTT is potentially costly and cumbersome. We studied the role of the OGTT for diagnosing diabetes and the accuracy of FPG and glycated hemoglobin (HbA1c) for predicting a diabetic OGTT before KTx. Design, setting, participants, & measurements: In this cross-sectional study, 889 first single-kidney transplant candidates without diabetes, mainly white, performed an OGTT during the transplantation workup. Results were studied using receiver operating characteristic analysis. Results: Of 72 (8.1%) patients with undiagnosed diabetes, only 16 (22%) had a diabetic FPG (≥126 mg/dl [≥7.0 mmol/L]). In patients with a nondiabetic FPG, diabetes (2-hour plasma glucose [2h-PG] ≥200 mg/dl [≥11.1 mmol/L]) was predicted by FPG but not by HbA1c. Performing the OGTT in patients with FPG 92 to 125 mg/dl (5.1 to 6.9 mmol/L) identified 65 (90%) patients with diabetes (16 by FPG, 49 by 2h-PG) and required seven OGTTs per patient identified. Subjecting all patients with FPG <110 mg/dl (<6.1 mmol/L) to the OGTT identified 60 (83%) patients with diabetes (16 by FPG, 44 by 2h-PG) but required 14 OGTTs per patient. Conclusions: The OGTT was paramount in finding most cases of undiagnosed diabetes before KTx. FPG but not HbA1c predicted a diabetic OGTT. We suggest that white KTx candidates without diabetes perform a pretransplantation OGTT when FPG is 92 to 125 mg/dl (5.1 to 6.9 mmol/L). Assessment of glycemic status before kidney transplantation (KTx) is important to enable patients with undiagnosed diabetes to be identified. In Norway, these patients have been prescribed cyclosporine rather than tacrolimus after KTx. The underlying rationale has been to lower the risk for posttransplantation hyperglycemia while maintaining short- and long-term outcomes for the kidney graft (1). In addition to undiagnosed diabetes, even nondiabetic glucose abnormalities can be important. They may threaten patient survival before KTx (2) and seem to predict new-onset diabetes after KTx (NODAT) (3–6). NODAT is associated with increased cardiovascular morbidity and reduced patient and graft survival (7–9). According to available guidelines, the pretransplantation workup of KTx candidates seemingly without diabetes should include an oral glucose tolerance test (OGTT) when fasting plasma glucose (FPG) is <110 mg/dl (<6.1 mmol/L) (10); however, no clear explanation is provided to substantiate this recommendation. Specifically, it is unclear why patients with FPG 110 to 125 mg/dl (6.1 to 6.9 mmol/L) are not entailed. The recommended approach also suggests performing the OGTT in a large number of patients, making it time-consuming and costly in clinical practice. To select patients for a diagnostic OGTT, screening strategies based on FPG or glycated hemoglobin (HbA1c) have been proposed for patients who have undergone transplantation (11–13) and the general population (14); no such approach has been explored in KTx candidates. Using common glycemic tests, this study aimed to identify a simple and effective strategy for detecting undiagnosed diabetes in KTx candidates. The need for an OGTT was examined, along with the accuracy of FPG and HbA1c for predicting a diabetic OGTT. FPG and HbA1c cutoffs were studied to help select patients who should proceed to a diagnostic OGTT. To these ends, pretransplantation OGTT data were studied in all patients who had ESRD but not diabetes and were referred for a first single KTx in Norway during the previous 7 yr. This is a cross-sectional, population-based study of glucose metabolism in nondiabetic KTx candidates in Norway. All adult patients (≥18 years) who had nondiabetic ESRD and were referred for a first single KTx between September 1, 2002, and February 1, 2009, were eligible. Patients were subsequently excluded when they had (1) known diabetes despite a nondiabetic renal diagnosis or (2) incomplete OGTT data. All patients gave a written informed consent for the use of their data, and the project was performed in accordance with the Declaration of Helsinki. During workup for KTx in Norway, all candidates without an established diagnosis of diabetes undergo a standard 75-g OGTT. The test result is provided on a standardized form enclosed with the KTx referral, which is forwarded to Rikshospitalet, the only transplant center in Norway. All notifications to the KTx waiting list are recorded in the hospital data system, which was used to identify eligible patients. The following data were extracted from referrals: Age, gender, ethnicity, body mass index, renal diagnosis, prednisolone use, dialysis mode and duration, hemoglobin, albumin, total cholesterol, HbA1c, FPG, and 2-hour postchallenge plasma glucose (2h-PG). The presence of known diabetes was also recorded, as defined from evidence that diabetes had been diagnosed previously (i.e., before the mandatory workup, by FPG ≥126 mg/dl [≥7.0 mmol/L] or random plasma glucose ≥200 mg/dl [≥11.1 mmol/L]). Plasma glucose and HbA1c were measured according to local practice. The American Diabetes Association criteria were used to classify patients as having diabetes (FPG ≥126 mg/dl [≥7.0 mmol/L] or 2h-PG ≥200 mg/dl [≥11.1 mmol/L]), impaired glucose tolerance (IGT; FPG <126 mg/dl [<7.0 mmol] and 2h-PG 140 to 199 mg/dl [7.8 to 11.0 mmol/L]), impaired fasting glucose (IFG; FPG 100 to 125 mg/dl [5.6 to 6.9 mmol/L] and 2h-PG <140 mg/dl [<7.8 mmol/L]), or normal glycemia (FPG <100 mg/dl [<5.6 mmol/L] and 2h-PG <140 mg/dl [<7.8 mmol/L]) (15). The World Health Organization classification was studied for comparative purposes (Table 1) and differs from the American Diabetes Association classification with respect to IFG (FPG 110 to 125 mg/dl [6.1 to 6.9 mmol/L] and 2h-PG <140 mg/dl [<7.8 mmol/L]) and normal glycemia (FPG <110 mg/dl [<6.1 mmol/L] and 2h-PG <140 mg/dl [<7.8 mmol/L]) (16). Patients who had diabetes, IGT, or IFG were defined as having hyperglycemia. Mean ± SD, median (interquartile range), or frequencies (%) are given. Groups of glycemia were compared using parametric (t test, ANOVA), rank-based (Mann-Whitney, Jonckheere-Terpstra), or χ2 methods, with Fisher exact methods as appropriate. Bonferroni corrections were used for multiple comparisons. The agreement between fasting and postchallenge glycemia was assessed using weighted κ values. Receiver operating characteristic (ROC) analyses were used for patients with FPG <126 mg/dl (<7.0 mmol/L) to assess the accuracy of FPG or HbA1c for predicting a diabetic 2h-PG. An area under the ROC curve (AUC) of 0.5 corresponds with the indiscriminate reference line, whereas 1.0 indicates perfect accuracy. Optimal cutoffs represent the point on the ROC curve yielding (1) maximum sensitivity and specificity (i.e., point closest to the top left corner) or (2) maximum vertical difference between the ROC curve and the reference line (17). The latter difference equates to (sensitivity + specificity − 1); the largest difference achieved is termed the Youden index; 1.0 represents perfect accuracy. Analyses were performed in SPSS 17.0 (SPSS, Chicago, IL). Two-sided P < 0.05 was considered statistically significant. A reference test result can influence whether a screening test is performed and/or reported. Conversely, a screening test result can influence whether the reference test is performed (verification bias) (18). Both mechanisms can potentially lead to information bias. The presence of information bias was addressed by studying patients with complete glycemic data (FPG, 2h-PG, and HbA1c) and by replacing missing data with statistically probable values using multiple imputation (19,20). This is detailed in the supplemental material. A total of 889 of 1111 eligible patients were included in the study (Figure 1). Two excluded patients without known diabetes had a diabetic FPG. Both were classified as having incomplete OGTT data, because there was only one glucose measurement and no evidence of previous diabetes. By July 15, 2009, most included patients had undergone KTx (n = 797). The remaining patients were still awaiting KTx (n = 51), had died on the waiting list (n = 32), or had permanently been taken off the list because of comorbidity (n = 9). Primary renal diagnoses were glomerulonephritis (n = 276 [31%]), nephrosclerosis (n = 204 [23%]), cystic kidney disease (n = 160 [18%]), pyelonephritis/other interstitial kidney disease (n = 107 [12%]), and other/unknown diagnoses (n = 142 [16%]). Patient disposition. All adult (≥18 years) patients who had nondiabetic ESRD and were referred for first single KTx within the study period were considered eligible (n = 1111). Upon data retrieval, patients were excluded from participation when they had (1) acknowledged diabetes before transplantation workup or (2) incomplete OGTT data. DM, diabetes mellitus. Patient characteristics are presented in Table 2. Fifty (6%) patients were nonwhite, and 298 (34%) were female. Hyperglycemia was seen in 402 (45.2%) patients (72 diabetes [8.1%], 230 IGT [25.9%], 100 IFG [11.2%]). HbA1c was available in a nonconsecutive subset of 514 (58%) patients and correlated with FPG (r = 0.16) and 2h-PG (r = 0.18; both P < 0.001). Thirty-eight percent (n = 341) of patients were on dialysis at referral; this proportion doubled by the time of KTx (72%; 574 of 797 patients). At referral, dialysis patients had lower FPG and HbA1c as compared with patients who were predialysis (92 ± 13 versus 94 ± 11 mg/dl and 5.4 ± 0.6 versus 5.6 ± 0.5%, respectively; both P < 0.015). Only 16 (22%) of 72 patients with diabetes had diabetes by FPG (Table 1); therefore, omitting the OGTT entirely would reclassify 56 (78%) of 72 patients with diabetes as not having diabetes. Limiting the OGTT to patients with IFG would reclassify 29 (40%), alternatively 44 (61%) of 72 patients with diabetes, depending on the IFG definition. Fasting and postchallenge diagnoses were only modestly concordant (weighted κ agreements of ≤0.3). Results of the ROC analyses are shown in Figure 2, Tables 3 and 4. The AUC for FPG was 0.734 (95% confidence interval [CI] 0.674 to 0.795). 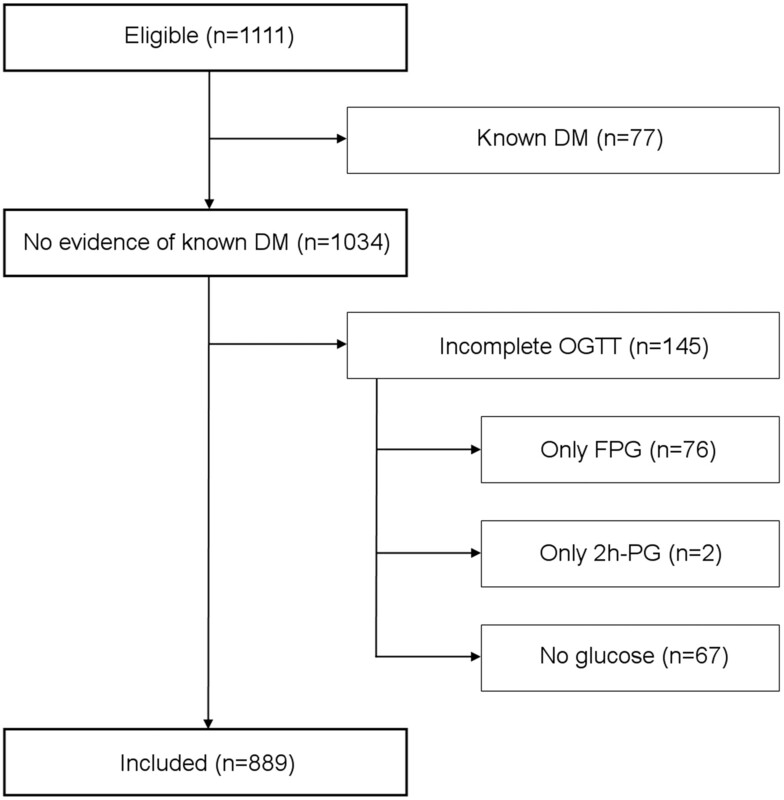 When performing the OGTT for patients with FPG 92 to 125 mg/dl (5.1 to 6.9 mmol/L), 49 (88%) of 56 patients with a diabetic 2h-PG were identified. The 92-mg/dl (5.1-mmol/L) cutoff was identified as optimal by the Youden index. Overall, 65 (90%) of 72 patients with diabetes were identified by this strategy (16 by FPG, 49 by 2h-PG), which required an OGTT for 463 (53%) of 873 patients with a nondiabetic FPG. These ROC results were consistent among the predialysis patients as well as for patients on dialysis (data not shown). ROC curves. Analyses were performed on patients with FPG <126 mg/dl (<7.0 mmol/L). The ability of FPG (A; AUC 0.734 [95% CI 0.674 to 0.795]) and HbA1c (B; AUC 578 [95% CI 0.482 to 0.673]) to predict a diabetic 2h-PG (≥200 mg/dl [≥11.1 mmol/L]) parallels the area between the curved and the diagonal reference line (AUC). The top left corner of each panel represents AUC 1.0 (perfect sensitivity and specificity). *Youden index (largest vertical difference between the curve and the reference line); **point closest to the top left corner of the panel. 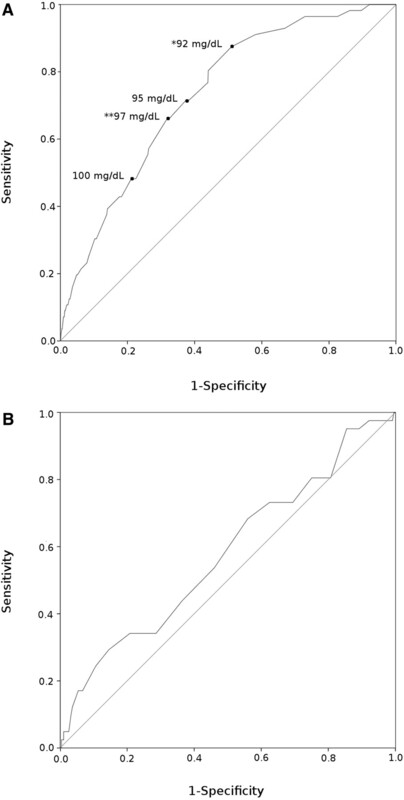 For HbA1c, the AUC was 0.578 (95% CI 0.482 to 0.673), indicating that HbA1c could not be used as a general tool to identify patients who should proceed to a diagnostic OGTT. The accuracy improved when studied in predialysis patients alone but did not surpass that of FPG even in these patients (AUC 0.689 [95% CI 0.586 to 0.791] versus 0.710 [95% CI 0.624 to 0.795], HbA1c versus FPG, respectively). The potential gain from using HbA1c alone or combined with FPG was negligible whether patients had or had not been started on dialysis (data not shown). ROC results were almost identical for patients with complete glycemic data (n = 514), as well as in multiply imputed data sets (Supplemental Tables S1 through S9); therefore, results did not seem to be significantly influenced by information bias. In this study, a majority of the KTx candidates with undiagnosed diabetes required an OGTT to be identified. Despite having a poor diagnostic sensitivity in its own right, FPG seemed to be an accurate test for predicting a diabetic 2h-PG. A high detection rate for diabetes could thus be maintained when restricting the OGTT to patients having FPG within a selected range. In contrast to FPG, HbA1c did not seem useful as a general tool to predict a diabetic 2h-PG. Only approximately 20% of patients with diabetes could be identified by FPG in our study, compared with 50% early after KTx (13) or 70% in the general population (14). The low diagnostic sensitivity of FPG may have resulted from the exclusion of patients with known diabetes. It could also be related to general glucometabolic abnormalities known to occur in ESRD. Although most patients with ESRD are insulin resistant (21), fasting glycemia is often maintained or even lowered as a result of the reduced renal clearance of insulin. Consequently, hyperglycemia in patient with ESRD may primarily be a postprandial phenomenon and thereby more easily revealed using a formal glucose challenge, such as the OGTT (22). This is consistent with two previous reports (23,24) and suggests that the OGTT is more important for detecting diabetes before as compared with after KTx. Nonetheless, the OGTT is also important after transplantation, because NODAT develops even in patients who have normal pretransplantation glucose tolerance. In the general population, 80% of patients with undiagnosed diabetes were identified when individuals with FPG 110 to 125 mg/dl (6.1 to 6.9 mmol/L) underwent an OGTT (14). In the early posttransplantation period, this approach identified 70% of the patients with diabetes, and a cutoff of 95 mg/dl (5.3 mmol/L) was proposed to increase detection rates (13). This cutoff was chosen on the basis of the argument that, given the serious complications of diabetes, 80% sensitivity should be a minimum for detecting a diabetic 2h-PG after KTx. In our view, this detection rate is also appropriate before KTx. Our data suggest, however, that 110 mg/dl (6.1 mmol/L) and possibly even 95 mg/dl (5.3 mmol/L) are inappropriately high cutoffs for FPG before KTx, identifying only approximately 20 and 70%, respectively, of patients with a diabetic 2h-PG. To identify ≥80% of the patients with a diabetic 2h-PG in our study, an OGTT had to be performed for patients with FPG 92 to 125 mg/dl (5.1 to 6.9 mmol/L). This identified 90% of all patients with diabetes and required an OGTT in roughly 50% of patients with a nondiabetic FPG. These results are very similar to those achieved early after KTx using a 95-mg/dl (5.3-mmol/L) cutoff (13). Importantly, this approach was also more efficient as compared with that proposed in the available guidelines (OGTT if FPG <110 mg/dl) (10). In our study, the latter identified 60 of 72 patients with diabetes (16 by FPG, 44 by 2h-PG) by subjecting 810 patients to an OGTT (Table 1; OGTT if normal FPG by World Health Organization criteria); therefore, this approach required 14 OGTTs to find one patient with diabetes (810 tests/60 diabetes), compared with only seven OGTTs when restricting the test to patients with FPG 92 to 125 mg/dl (463 tests/65 diabetes). In individuals without kidney disease, HbA1c and FPG seem to be equally effective for detecting diabetes (25). HbA1c also seems to be useful after KTx once hematocrit has stabilized (13). In nontransplantation ESRD, however, HbA1c is difficult to interpret. Factors that increase the turnover of red blood cells, such as erythropoietin use, iron supplements, and blood loss during hemodialysis, can falsely reduce HbA1c (26–28). Moreover, the interpretation of HbA1c is confounded by an increased formation of carbamylated hemoglobin (cHb) in patients with uremia (27–30). First, HbA1c and cHb have similar isoelectric points, resulting in a tendency of certain HbA1c assays, charge-based ones in particular, to report a result that in fact is the combined concentration of HbA1c and cHb (31,32). Second, the formation of HbA1c and cHb may interact, because carbamylation and glycation occur at similar binding sites on the hemoglobin molecule (30). These factors could explain the general impression in this study that HbA1c had a limited diagnostic accuracy in KTx candidates. Although HbA1c may potentially be of some use in predialysis ESRD, only FPG was consistently accurate for predicting a diabetic 2h-PG in the population of KTx candidates as a whole. It is debatable whether FPG, 2h-PG, or HbA1c should be used for diagnosing diabetes (33). Fasting and postprandial hyperglycemia identify different subsets of patients and may have different pathogeneses and prognostic implications (14,34). Although diabetes defined by any criterion predicts microvascular complications (33), the postprandial criteria seem more predictive of macrovascular end points (34,35). Given the major macrovascular burden in transplant patients, the OGTT could have particular relevance in KTx candidates. Postprandial criteria for diabetes were thus emphasized in our study. It is not known, however, whether KTx candidates with diabetes by FPG fare better than those diagnosed by 2h-PG, let alone at which thresholds the risk for posttransplantation complications begins to rise. The extent to which pretransplantation glycemia should guide the choice of immunosuppression is also uncertain. The potential significance of detecting diabetes by an OGTT before KTx should be interpreted with some caution until these issues are studied prospectively. To our knowledge, this is the first study to describe a case-finding strategy for undiagnosed diabetes in KTx candidates. The large sample size was an important strength. National data were available for a 7-yr period on all patients who were referred for a first single KTx, which we believe improves the external validity of the study. Nonetheless, our study has clear limitations. First, the study population was primarily white. This reduces the generalizability of our results to nonwhite populations. Nonwhite patients were kept in the analysis to render population-based results but were too few in number to examine whether ethnicity-specific differences were present. White patients were well represented, however, and results were the same when white patients were studied separately (n = 839; data not shown). Second, differences in laboratory methods between referring centers may have influenced the results. Nonetheless, our findings can be explained by pathophysiologic mechanisms and also represent a large body of real-life data. Third, the results may have been subject to information bias as a result of missing data; however, our sensitivity analyses provided little evidence that this was the case. Fourth, glucose was measured on only one occasion for each patient. The prevalence of diabetes may have been overestimated as a result of the intraperson variability of glucose measurements (36). In the absence of unequivocal hyperglycemia, repeat testing is indicated for screening detected diabetes (15). This is probably also advisable in KTx candidates. In this population, repeat testing may also be important to find incident cases of diabetes, the rate of which seems higher as compared with the general population (37). Repeat testing may thus be particularly relevant at centers experiencing long waiting times, where undiagnosed hyperglycemia could take a toll on pretransplantation survival (2). Finally, our case-finding strategy for diagnosing diabetes is ignorant of other diabetes risk factors. The optimal care for each individual patient also requires a detailed knowledge of such factors. The OGTT was of key importance in detecting undiagnosed diabetes in first single KTx candidates. Fasting glucose was helpful for predicting the occurrence of a diabetic 2h-PG. We suggest that white KTx candidates without known diabetes should undergo a pretransplantation OGTT when FPG is between 92 and 125 mg/dl (5.1 to 6.9 mmol/L). Compared with the available guidelines, this will considerably reduce the number of patients who need an OGTT and also identify a larger proportion of patients with undiagnosed diabetes. Contrary to FPG, HbA1c did not seem useful as a general tool to predict a diabetic 2h-PG among KTx candidates. Further studies are needed to verify our findings, particularly in other ethnic groups. This project was financed by grants from the Norwegian Foundation for Health and Rehabilitation. See related editorial, “Transplant-Associated Hyperglycemia: Shedding Light on the Mechanisms,” on pages 560–562. Supplemental information for this article is available online at www.cjasn.org.